administration to see if it was feasible introducing similar trips for tourists. The trip was about 80km spread over 4 days and absolutely loads of fun. 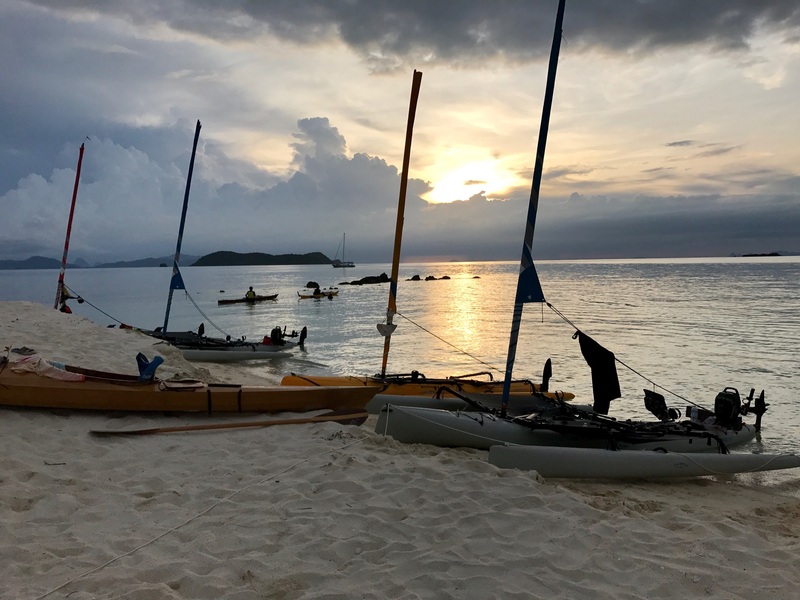 The combination of Hobie Islands and the sea kayaks was interesting as in very low winds the sea kayaks would pass the Islands, but with a little favorable wind the Islands would take off. However, at the end of each day the entire group ended up together to camp out on the beach. 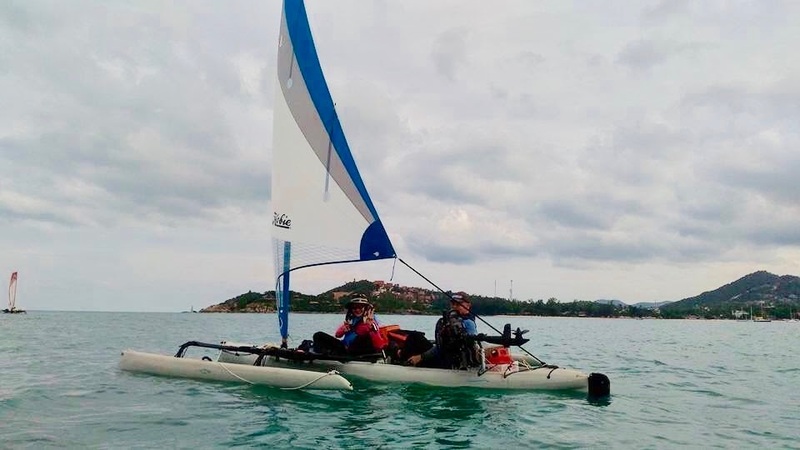 I've included a few photos courtesy of Melvyn Privett and more can be found on FaceBook (yes I know most don't like FB) at Hobie Island Owners Club Thailand. 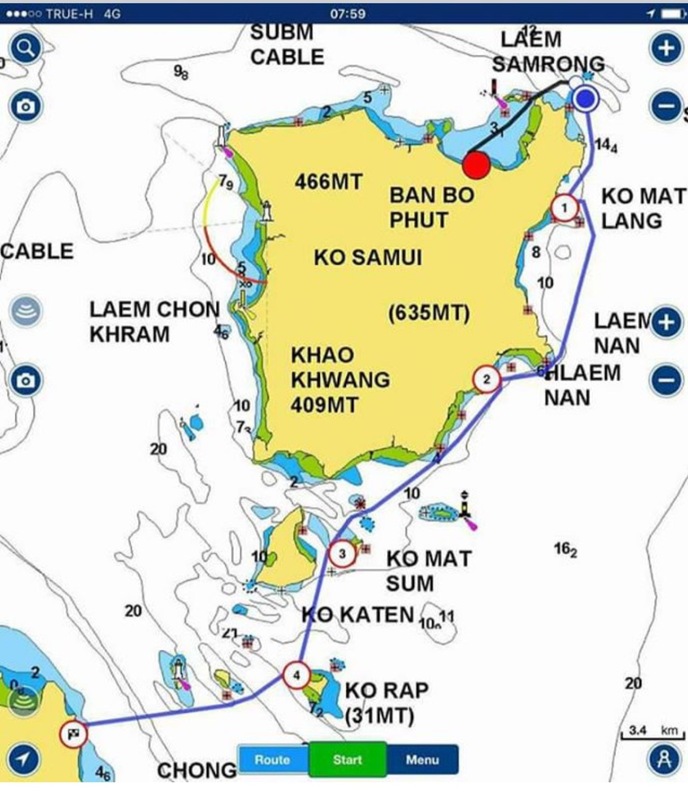 Our next trip will be around New Year to the Koh Chang area near the Cambodian border. Looks like a great trip! It looks like one of our many trips in South Florida, but with more kayaks. On our trips, we occasionally will have 1-3 kayaks, but seldom more. On longer trips, like our annual 75 mile trip (120 km), we never have any kayakers; although, I don't attempt to attract kayakers to this trip. Kayakers are certainly capable of doing this trip, I just don't give them notice. In any case your trip looks great. Thanks Keith. I follow your trips with awe. 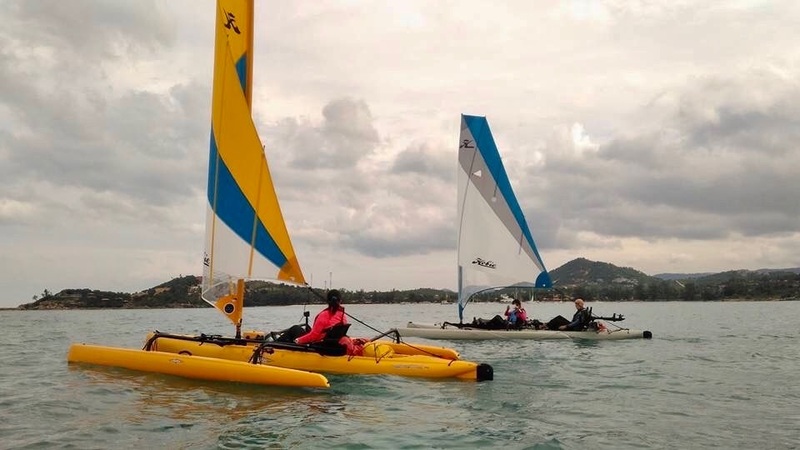 Actually this trip was arranged by one of the sea kayakers working together with the local authorities. However after trying my TI he is now looking for a used AI or TI. They really are the perfect work horse when used within their limitations. That water looks pretty inviting! Is the area remote or is there other boat traffic? Sounds like a lot of fun. Thanks for posting it. Koh Samui is a tourist island but there is still the local population which near water includes a strong fishing industry. Therefore there are quite a few fishing boats working the waters. I'd guess they are about 50' to 60'. To be honest we rarely encountered them. Closer in to the beaches there are sailboats and motor launches moored, but we saw few actually sailing. The water was beautiful and surprisingly clean. I'm used to the usual plastic garbage floating but it was really quite clean, as were the beaches. We were island hopping and the islands off the big island were very sparsely populated. We as a group had the beaches to ourselves. We had so much fun, we are thinking of making it an annual event for the Hobies.